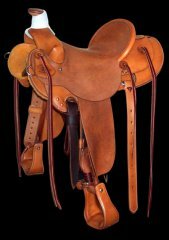 Over the years we have made more Wade and Western Stock saddles than any other type but we we have also made a lot of 'Swell Fork' saddles. Some of the more popular styles are shown on this showcase but you are not restricted to these. Swell fork roping saddles that we make are built on Warren trees to the following patterns – Ellensburg (14” swell), Lieuallen (13” swell), Don King Roper (13” swell), Will James (13” swell). 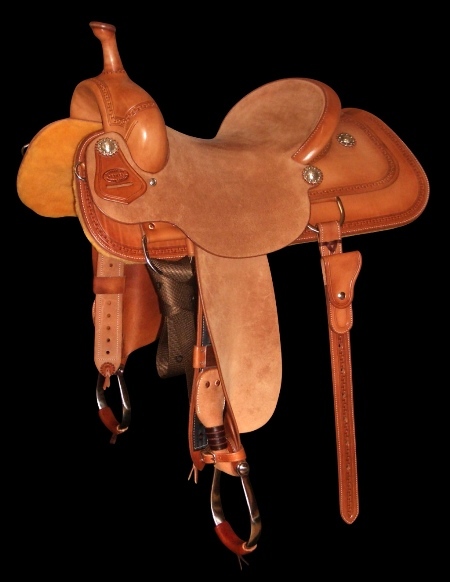 Our Buster Welsh Cutting saddles are made on Addison Sandy Saddle trees. 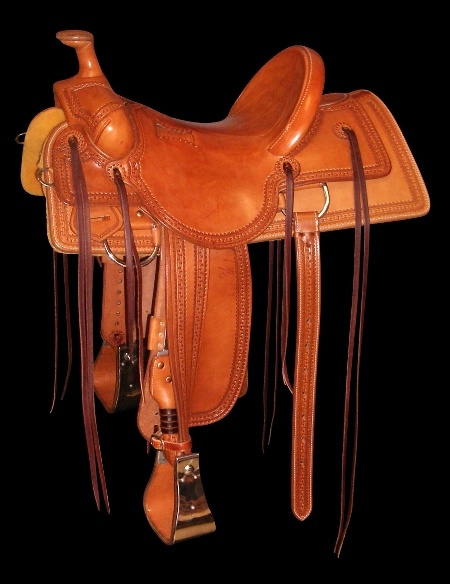 Check out the showcase and contact us if you would like more information on one of these saddles. Roping and Cutting Saddle Pricing Page. 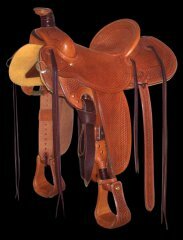 Dee rigging, 'Carlos'/flower edge border tooling, SS bound Moran stirrups, Cheyenne roll cantle, 8-button seat with exposed stirrup slots. 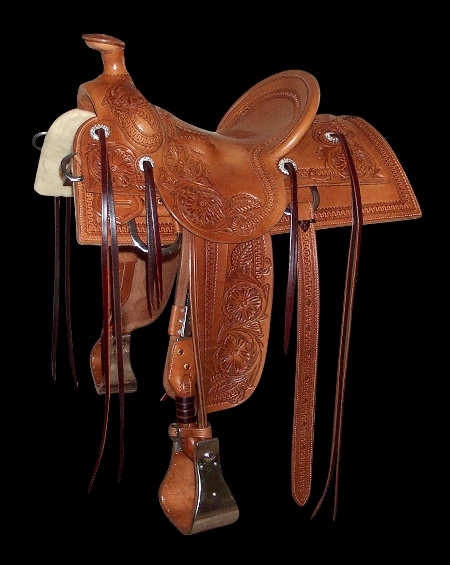 Flat plate rigging, full basket stamp/'Carlos' tooling, leather covered stirrups, straight cantle. Dee rigging, Partial floral with 'Carlos'/flower edge border tooling, SS bound Moran stirrups, straight cantle, 8-button seat with exposed stirrup slots. 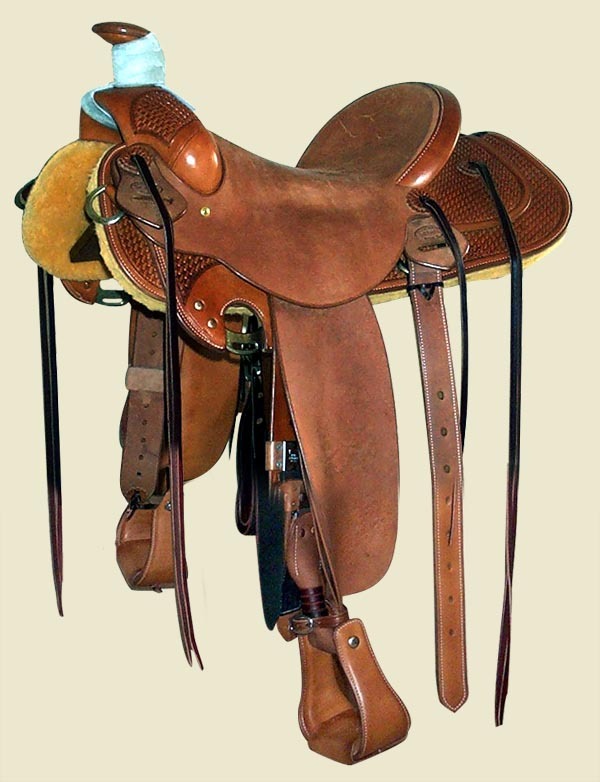 Flat plate rigging, leather covered stirrups, straight cantle. Half rough out. Dee rigging, hlaf 'Carlos' border tooling, polished SS oxbow stirrups, Cheyenne roll cantle. Half rough out. Flat plate rigging, semi square skirts, half basket stamped, leather covered stirrups, Cheyenne roll cantle. Half rough out.